Today a completely different topic Do you have a tattoo that you would like to get rid of? Of course I have one!!!! Anyway, I wanted to remove that tattoo for years, but didn’t take care about it until last week. I’m a person dooing a lot of research and then make my own decisions – I’m not running from one studio to the next, let them advise me umpteen times – ultimately every studio will recommend its own method … and so I like to have a reasonably informed opinion. Initially I messed up all the different types of lasers. Then I realized that there are only a few types of lasers that are suitable for the removal of tattoos – Today Nd:YAG and Ruby ​​laser are the best choice. Of course there are different producers and I think a modern device is always more accurate and therefore results are better than older devices. Therefore, one should also know which device is used by a studio and how old they are. Ultimately you have to take the risk of such treatment on your own and the result is highly dependent on the quality of the laser. My tattoo is not really small, about 50 cm², but after about 15 minutes the treatment was over. 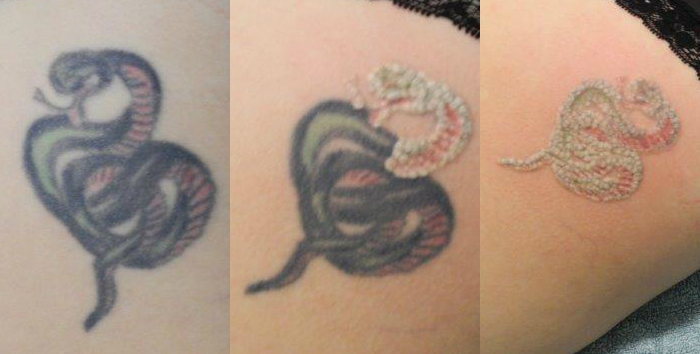 Because I have a black, red, green tattoo, both lasers were used. For black and red the Nd: YAG laser with different lenses and for green the ruby ​​laser. After treatment, the area with the tattoo burns like an average sunburn – not really nice, but nothing really bad All in all, the treatment is really bearable Of course you have to take care about a few things after the treatment; most of all to prevent scarring – but I think anyone who wants to have a good result will do this. I’ll go for my second treatment in 7 weeks and even look forward for it – then I definitely will tell you more. As far, I think, that’s enough information Stay Updated!